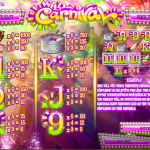 Wild Carnival is a 5 reel 50 paylines slot game released in 2012 by Rival. It revolves you might have guessed around the Brazilian carnival and other similar ones in latin America. If Brazil is too far for you but you would still like to experience all the fun times then this game just might be for you. The Wild in this game is the Blue Mask symbol which will substitute other symbol to create a winning combination. It appears on reels 1, 3 or 5 and will expand and fill the reel to help you complete a combination. There are also two scatters here. 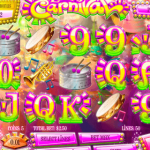 The first one is the Peacock symbol and landing 3, 4 or 5 anywhere on the reels will reward you with 5, 10 or 20 Free Spins respectively. The multiplier for those wins is 3x with a chance to re-trigger the Free Spins when landing more scatters. The second scatter is the Gold Mask symbol and landing 3 or more will trigger the Bonus Round. You’ll be taken to a different screen with a dancer and 16 boxes. You choose 5 boxes which contains a prize for you and an accessory for the dancer. Bonus Bead – One of the symbols is the Bead Necklace and each time you land one a meter fills up. Once you’ve collected 12 of those you will receive a prize based on your bet. This can be won over and over. Just like a real carnival this game is fun, loud and wild. You get the feeling that anything can happen here and it is very much true. The bonus features are extra cool here so we happily recommend this game. The only downside is the just ok RTP at 95% but it shouldn’t keep you from dancing the Samba! Are you a fan of old TV game shows? 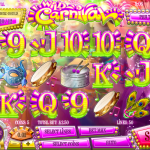 Then you should consider playing Wheel Of Cash a 5 reel slot by Rival.